Please tell us what your current creative project is? What are you working on, releasing, exhibiting? I am working on various sized canvases for a solo show at The Art House, Southampton, from September 20th – November 13th 2016. I am painting abstract florals and landscapes. I have an impressionistic in style, and my main medium has been acrylic inks for the past 14 years. Nature is my subject matter, and I revel in capturing the shapes and forms, the way the grass blows in the wind, and the incredible variety of shades and texture found. I grew up just outside of Salisbury, and spent a lot of time outside. My current paintings have a vibrant energy about them; movement and varying shades are encompassed within, and the tools vary from brushes and pens to porcupine quills. It is the basis of the energetic style I have mastered. I have a solo show booked for next year at The Southampton City Art Gallery from May – July 2017, which is framed landscapes and floral abstractions. Currently I have work in the Summer Exhibition at Rum’s Eg Gallery, Romsey, I sell work at The Art House, and am also exhibiting at Frith & Co Framers plus The Fisherton Mill; both of which are in Salisbury. My biggest goal this year is to create a big body of work, to have exhibitions and shows, to exhibit more work than ever before, to meet other artists and exchange ideas. I am also improving my photo-shop and illustrator skills so I can start designing and adjusting ink pieces to print onto fabric. I will be making my own cushions, duvet covers and pillows, and sell fabric. I will be designing and making handmade batik pillow cases and sheets . I have also started painting stylised faces, based on an online class I completed with a brilliant Artist named Shiloh Sophia. I have been working on some facial commissions . My wish is to develop the faces further, as I have not broached this subject before. I have, however, thoroughly enjoyed the process and am painting more. They are the embodiment of emotion, and are painted to inspire and motivate the viewer. I want to ignite passion in others, whether that be to paint or to live out their wishes and dreams, and do what they love in general. Regarding the floral work and landscapes, my wish is for the viewer to feel good, happy, at peace and calm- to be transported to another place, to be in the moment as I am when I paint. I may want for that, I accept that may not happen; but I can at least try. I will go deeper within myself and emotions, to let go (more), to create work that inspires others to pick up a paintbrush and create something from nothing. I know that putting art out there is vulnerable, and I hope to show others through exhibiting that they can do it too. A lesson I have learnt is to start before you are ready, and to try , try and try again. If one is passionate about something, to just do it and not look back, to forge forward and do what the world needs- to do things with love. I hope to show and demonstrate the love I pour into my work. It might be scary , because artists face criticism, but it is far better to try than never even attempt something. Because I love it. Painting provides a conduit to emotional release, something I understood from a young age. Painting is in my blood, and I often remember my Granddad when painting skies, or trees, because he was a master at capturing both. I love what I do. I have been drawing for a long time. Drawing and painting is what I do to make sense of my world. I paint when I am happy, sad, irritable, tired, moody, grumpy, joyful, ecstatic, relaxed, tense. I paint whatever the weather. I paint to bring life to colour, vibrancy and joy. I bring love to the world. I dissect what I see in the natural world, and make (what I hope are) beautiful images. I am obsessed with pictures, I take photos of my work, and then add filters and change things up, then make prints. I pour my heart and soul into my work, and my emotions shine through. Art is a form of therapy and meditation for me, it is cathartic to be able to release the real me onto paper, and indeed allow my feelings to be placed on something outside of me and my mind. It is extremely satisfying to paint how I feel, with colour. I have my own style and I use colour and shape and go through phases of using the same shapes over and over, until I am inspired by something else. I am passionate about painting, and it really is extremely satisfying and liberating to paint how I feel, whether that is in detail or not. I like to allow space for the detail and the more broad colours and textures. Deep thoughts translate into dark colours; light and vibrant hues are the embodiment of joy, love and gratitude. Painting helps me be in the present moment, where nothing else matters. I do what I do to show my children that being passionate about something is a good thing, and that art can be a successful venture. I want to be a commercial artist and make my living from what I do. I have honed my skills, worked very hard at what I do. Onward and upwards, finding a way. Tell us about your recent work and your process in creating it. My recent work is stylised in the form of landscape, skies and floral abstractions. I visit Hilliers Gardens and the New Forest, take far too many photos and paint according to how I feel. I see shapes, patterns and colours and translate the imagery into paintings. At present I am working on adding variations to shapes I currently use, and making ever different combinations of these translations. The process involves taking photos, remembering what I see and then experimenting with the combination of colours, shapes and patterns. I am directly impacted by how I feel , as I wear my emotions on my sleeve. Tell us about your past work? I have been using acrylic inks for 14 years and I have been on a journey of discovery. I started off painting large images of flowers or butterflies. I used inks on paper and then decided to be bold and paint large canvases. I use the pippet from the ink bottle to draw outlines when I am painting bigger, because it is an efficient way to put paint onto the canvas. I like some of my larger pieces to have a real fluidity and urgency about them, so I paint with rapid movement. Before inks I used acrylic paint, and created abstracts based on all my travels, involving shapes from the buildings I observed, the scenery and colours. When in Italy I painted arches a great deal, and I could not paint an abstract piece without an arch for some time. When in New Zealand I drew green landscape scenes involving the koru (spiral) shape. I sold work in Australia and New Zealand to help fund my travels. I started painting with watercolours aged 8, and so have a lot of experience with this medium. My first painting sale was aged 12 , at School , of a mouse. Does your art help you therapeutically? My art has always helped me therapeutically, from as young as I can remember. I recall sitting at my grandparents, staring out into their lovely garden, and drawing. I recall a real sense of calm. My granddad was an artist. I still feel his presence sometimes, when I am drawing skies and trees and when I leave my paint brushes in water too long, as he would have told me off! He taught me to use a knife to cut pencils as sharpeners waste too much of the pencil. He taught me to paint trees from the base up, as this is how they grow. My art helps me organise the emotions in my mind. It always feel good to paint, even if I produce something I don’t like, I realise it has its purpose and place. If I am combining techniques, and they don’t work, for example, I know that at least I tried. I then understand I need to tweak something, whether that is colour or shape. Has your “art” saved your life in any way? My art has saved me from feeling low many a time. I can’t say that it has literally saved my life. But if I didn’t do it, or couldn’t do it, it would profoundly affect me in a negative way. I feel that I am most creative when I can paint, and it translates to innovative cookery and other activities, like games I create with the kids, or ideas I want to share with children at school. I feel a lot of gratitude at times, for the fact I am able to produce pleasing images. I understand that my images have an impact on people, to positive affect. This is good for me, good for my passion. Sometimes I wonder why I paint; but when I know it affects me positively, and others, there is no reason to stop. Being passionate is all that matters. Gustav Klimt has been an inspiration, with his beautiful use of colour and pattern. I love the sensuality of Georgia O’Keefe’s work. I also very much enjoy Turner and the feelings they evoke within me. I have started painting landscapes (created in my mind) in the last 3 years, and I really enjoy painting skies. I find Monet’s work moving and feel at peace when I view them. The colours and textures are stunning. Pete Gilbert is an artist from the New Forest . He paints beautifully, using watercolour. I love the vitality of his work, and he inspires me greatly. Yes. I hope to bring forth love and a sense of calm with my work. My aim, and hope, is for people to put my work on their walls and be transported elsewhere for a while, to daydream and enjoy that precious time, to live in the moment as I do when I am creating them. I want to continue with my art practice, to thrive and continue to sell internationally, and reach more people. I want to show my children (all 3 of them) that it is possible to have a passion and do well financially- to be happy in my work and fulfilled, and successful in contributing to them and their futures. I want to show the two can go together. I believe that passion and continued action are firm friends. So, the change is that I want to dispel the myth of the starving artist, to thriving artist. 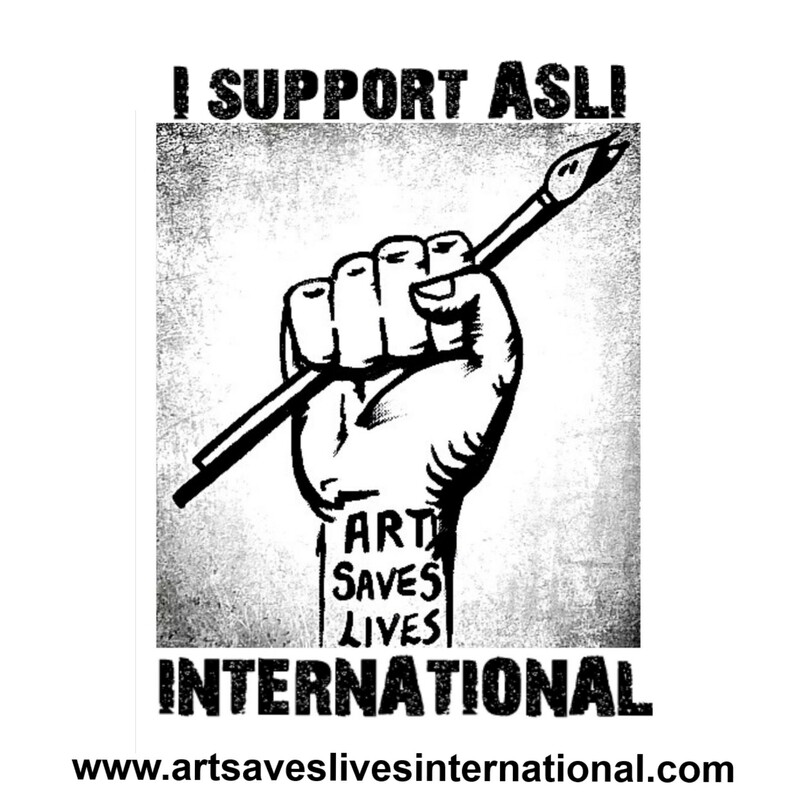 Do you have any particular causes and campaigns your art is in aid of, highlights or discusses? I am very keen to incorporate my art with emotional intelligence. I understand, from personal experience, how important it is to talk through our emotions, what is bothering us, and be able to voice how we feel. I have started to create a course on inner values for School aged children (I will turn it into an e book as well). My aim is to encourage teachers and other adults alike to work with the younger generation mainly on compassion, love, self love and gratitude. I believe learning inner values is key to a more peaceful world, and wouldn’t we all agree that is what we need? I will be combining my art practice with these values when creating the course, and e book. The course will be aimed at Schools and home schooled environments, plus anywhere else who will take me on! I believe working with mind and body is key to healing, and I will be teaching sessions on chakras, where I combine the art and colours with stored (negative) emotion that require a release. My children are great guinea pigs for my ideas! Future plans are to sell more work internationally, to exhibit in Europe and further afield. I will be adding to my list of exhibitions, and visiting more Galleries to show my work. I will be adding videos of me at work, using my GoPro camera. Finally, I want to make some noise, and be seen, for I have been hiding in the shadows too long.